Golf shaft stiffness requirements vary with the age and skill of the golfer. Since the 1990s, improvements in golf club technology have helped increase the average distance of drives and other shots by up to 30 yards. One of the reasons for the increased range has been the improvement in golf club shaft technology over the same time period. 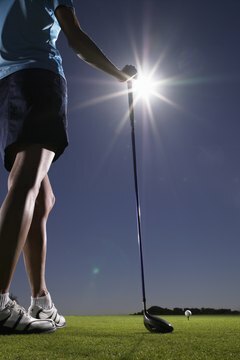 The golf club shaft is used to transfer the energy of your swing to the club head at impact with the golf ball. One of the factors that you will need to consider when searching for new golf shafts is the golf shaft thickness. Locate the stiffness rating on the golf shaft. The golf shaft stiffness groupings are senior, ladies, regular, stiff and extra stiff. Ladies stiffness has the most flex with extra stiff the least. Shafts from two different manufacturers with the same stiffness rating can have significantly different feels because there is no USGA standard for stiffness ratings. Locate the shaft's flex or kick point. This is the location on the shaft that flexes the most while striking the golf ball. The lower the point is on the shaft, the higher the ball flight. If you are comparing steel shaft stiffness, the difference in kick point will be minimal compared to the difference seen with graphite or composite shafts. Assess the difference in the torque ratings between the shafts. The torque rating will inform you on the amount of resistance that the shaft has to twisting and will range between 2 and 6 degrees. Lower shaft torques are normally associated with extra-stiff shafts used by lower handicap golfers. Try out the competing shafts by hitting practice balls to compare the feel of the shaft thickness. Due to the non-standard nature of shaft stiffness ratings, you can be deceived if solely purchasing a golf shaft based on the advertised thickness without first trying out the equipment. How Do I Calculate Golf Swing Weights?